In today’s digital world, if you’re not online, you might as well not exist. It might sound harsh, but the first place prospective customers check when they’re interested in a company or product is Google. The search engine processes millions of searches per second. So if you can’t be found, you’re missing out. And why wouldn’t you want to take advantage of such a huge pool of potential customers? Simply having a website, Facebook and Twitter account is not enough. Online marketing requires a plan to be successful. Curve can help you create awareness about your company or promote specific events or products by crafting a personalized digital marketing plan that includes both paid advertising and organic initiatives. Even if you’ve never heard of landing pages, you’ve likely landed on one before. A landing page isn’t just another subpage on your website. It’s a page that’s created for a specific reason: to generate leads. The most effective landing pages tell people what you are selling or offering, encourage prospective clients to contact you or fill out a form, and weed out the lookyloos. When you’re advertising a particular product or service, you don’t want to send potential customers to your website where they’re likely to click around and leave without contacting you. 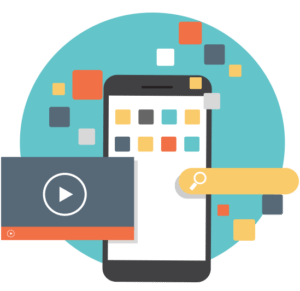 Landing pages have specific calls to action, so potential customers know exactly what they should do if they’re interested in what you’re selling. Curve has built many successful landing pages for our clients. For ECO Paving – a company that paves with 100 per cent recycled rubber – Curve designed a landing page to create awareness about this green alternative. The call to action was to contact the company for a free estimate. The landing page had 400 visitors, but more importantly, led to 15 conversions – a conversion rate of 3.75 per cent. Even the most captivating landing pages need advertising to help drive traffic to them. Otherwise, they simply exist in limbo and are highly unlikely to attract any leads. Facebook advertisements are extremely effective because they give businesses control over target demographics. So, if you’re tired of wasting money on advertising that spams the general public without a strategy, worry no more. 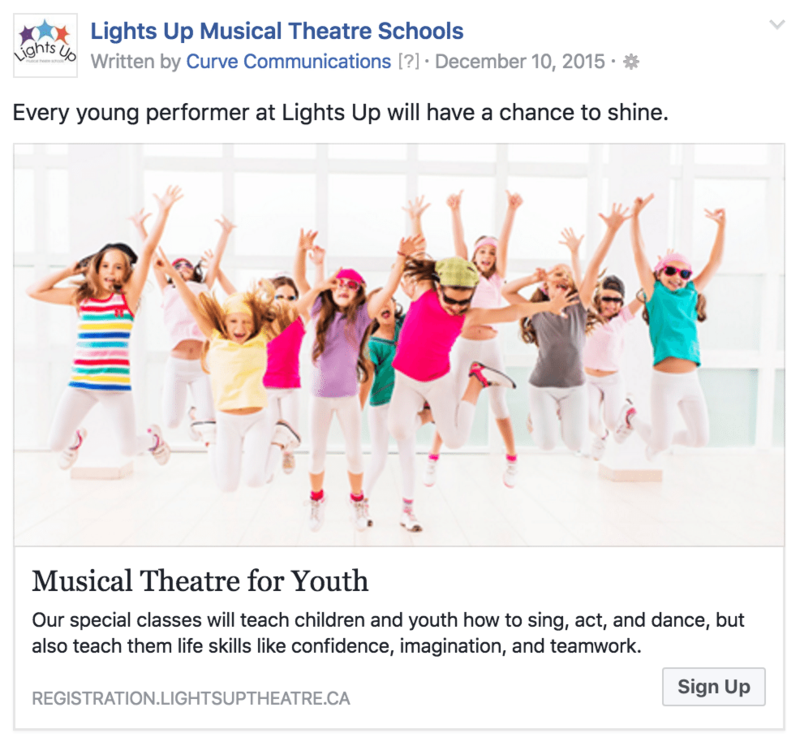 With Facebook ads, we can target prospective clients/customers based on age, location, gender, general interests, and even behaviour. Our team is creative, takes pride in thinking outside the box, and knows how to get results. 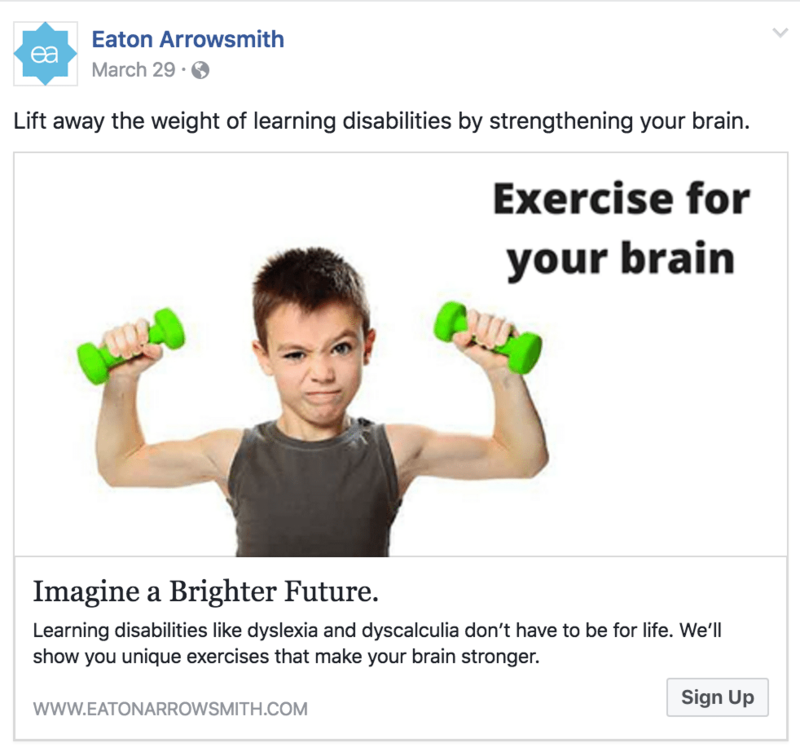 The below Facebook ad for Eaton Arrowsmith – which runs schools for children and adults with learning disabilities – received 1,312 clicks and 23,363 unique views with a cost per click (CPC) of $0.19. Whether you’re launching a new website, directing traffic to a landing page, or simply trying to create awareness about your company, Google AdWords are an excellent advertising option. You can choose between search, display and retargeting or a combination of the three. Search Advertising places text advertisements in front of searches for specific keywords. Display ads use banner advertisements to reinforce branding and increase online traffic. If you’ve ever visited a website and noticed ads for that company on other sites you view, you’re familiar with retargeting. The goal behind this type of ad is to keep brands relevant in the minds of a company’s target audience. So if someone visits your site, but doesn’t contact you, your ads will follow them. While organic reach through social media channels like Facebook is shrinking, it’s still important to engage with current and prospective customers online. In fact, many people want to have relationships with the brands they know and love. So, you need to share videos, photos, blogs you write, articles published by sources you follow, and much more. Of course, social media isn’t a one-way street. You don’t want to spam people with information. Instead, you need to engage with them and this takes time. We manage social media accounts for many of our clients, so they build strong online relationships with their customers without doubling their workloads. When it comes to digital marketing, companies need to use an integrated approach. It’s not about organic posting OR paid advertising; it’s about both working together to generate awareness about a brand.